This is an update to a post originally published in March, 2010. While it’s a good idea to begin thinking about the design of the book at an early stage in the development of a manuscript, changes in the manuscript along the way can blow what seemed to be a great design out of the water. One of my watchwords is to “design for the extremes.” Here is an example: I had what I thought was a great chapter opening design because all of the chapter headings I had seen were very short – two or three words – so it fit on one line. When I received the final manuscript, I noticed that chapter titles toward the end were much longer and, wouldn’t fit in the current design. Not only did the chapter title section need to be resized; many other elements on the page had to be recalculated and rebalaced. This may, in fact, be a better design. My point here, though, is that we had to backtrack and redo steps in the process we thought were complete: using up time and costing money. Your printer can provide valuable information that can help you save time and money. And different printers have different capabilities, affecting the page size that can be printed economically. Even among print-on-demand printers such as blurb and lulu, specifications can vary ever so slightly. 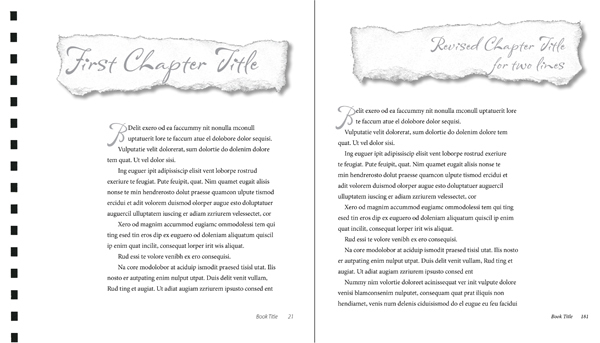 For example: both blurb and lulu offer a 10×8 landscape format, but lulu does not offer a dustjacket option in the size and format. And, the trim size is slightly different between the two. Not knowing this ahead of time could mean you have to resize your pages. It is very easy to get confused about which photos go where in a manuscript, which ones have been scanned or retouched, which caption and credit goes with which photo, etc. It’s also very easy to misplace digital files unless you establish a clear naming convention and folder system and create a worksheet to keep track of all the images. This is the area that seems to be the most troublesome for personal histories and others involved in producing privately published books. At what point do you show the book to the client? How is it presented? [While online proofing can be expedient as an intermediate step, I believe that final reviews and revisions should be handled on physical paper.] What are they expected to look for and respond to? How many review cycles are included in your initial estimate? And how will you handle excessive review cycles where the client continues to change the manuscript and/or images? 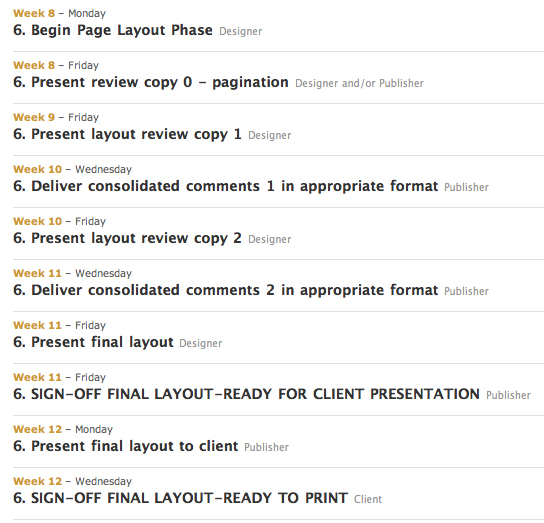 It may seem excessive, but the more specifically you spell out the review steps, responsibilities and deadlines, the smoother things seem to go. Nothing focuses people like having to sign their name on the dotted line. The first thing they want to know is: what am I agreeing to? Presenting a review copy to your client along with a sign-off form that focuses them on what they should be looking at is a good way to manage the review and revision process and to ensure that nothing is overlooked. In each case, you will want to develop a form that indicates to the client what to look for and what their signature means. The gist of it is that, by signing, the client agrees to proceed to the next step with the understanding that backtracking will likely to incur additional costs and delay the project’s completion. This entry was written by cj-madigan, posted on January 28, 2011 at 4:10 pm, filed under Book Thinking, Design Business, Personal History, Process/Workflow, Uncategorized. Bookmark the permalink. Follow any comments here with the RSS feed for this post. Both comments and trackbacks are currently closed. . View the archives for more.